I know it has been an exceptionally long time since my last post. Somewhere in the Golden Rules of Blogging (that doesn’t really exist, I just made it up), it says not to mention it when you have not posted to your blog in a long time, not to apologize or give excuses. Here, though, I think I have good reason to break that rule because I have been a neglectful blogger due to a positive change in my life that I would like to share. In early February, I started not only a new job, but I ventured down a new career path. It has been an adjustment and I’ve been busy. Also, until recently, I simply haven’t been in the blogging mindset. This job change is actually a career that I considered seriously while I was in university, but, for various reasons, abandoned and went to culinary school instead. The career I speak of is editing and it is something I have been drawn to for a long time. Right now, I am an editor for subtitles for theatrical movie releases. I work on creating and editing subtitles for English movies so that they can be translated into other languages to screen the film in non-English speaking places. And I love it. For the first time in my life, I am really excited about my job and I plan on keeping it for as long as they’ll let me. I still love to cook, to learn about food and cooking, and to write about it all, but through various experiences, I have learned that I do not enjoy working in food service. It has taken trying out a number of different food-related jobs for me to realize that the type of cooking I love to do, the type that I get excited about and love to talk about, is the cooking I do at home, in my own kitchen, where I am in charge and where there is no pressure for speed or perfection. So, for the time being at least, I am going to hang up my white coat to be a home cook while my professional life will be a whole different ball game. And now, on to more important things: food! Last weekend, I was feeling experimental so I decided to make tamale pie, which I not only had never cooked before, but I had never eaten before, either. Apparently, though, it’s an American classic, and I heard many people talk about it while I was living in the US. I decided that it was about time I gave it a go. For those of you who, like me, have remained woefully ignorant of the exciting world of tamale pie, it is really exactly what it sounds like. 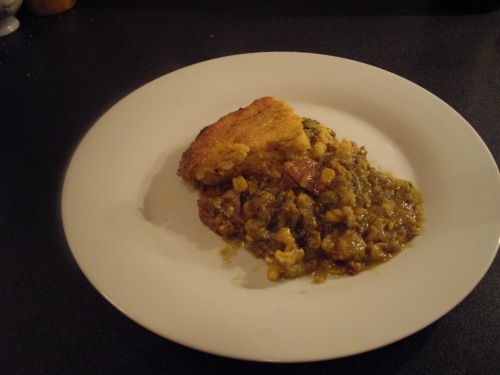 It’s sort of like a Mexican-American version of shepherd’s pie: the filling consists of meat, peppers, and whatever else you might stuff or top a tamale with, and the topping is a sort of cornbread, similar to the breading in tamales (only, not really, since it gets baked, not steamed). It sounded pretty good to me, so I started scouring the Internet for the best-reviewed tamale pie recipe I could find. As someone who has never had tamale pie before, I am not exactly very knowledgeable on the subject, but I think I found a winner with the recipe I used from Epicurious. The author is Molly Stevens, which is a good sign. She wrote the James Beard Foundation award-winning All About Braising: the Art of Uncomplicated Cooking, so the braised pork filling in this pie is exquisite. The steps for making the filling are like most braises, but with a few unique aspects. As usual, we start by browning the meat. 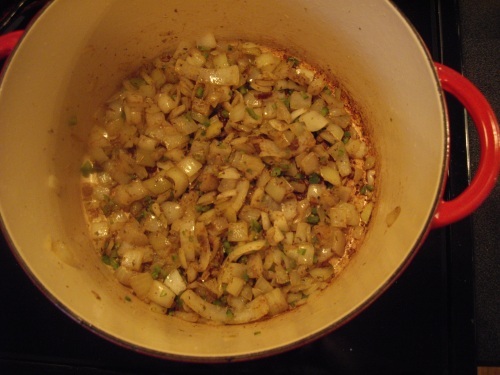 Next, we sweat onions and minced jalapeno. Then, cumin, coriander, and oregano are stirred in. After deglazing with chicken stock, the braise gets started. Into the pot goes salsa verde and that begins the process for the first thirty minutes. Then, we add roasted peppers and (I like this part) pureed corn. As you might imagine, this makes for a very thick, chunky kind of stew. 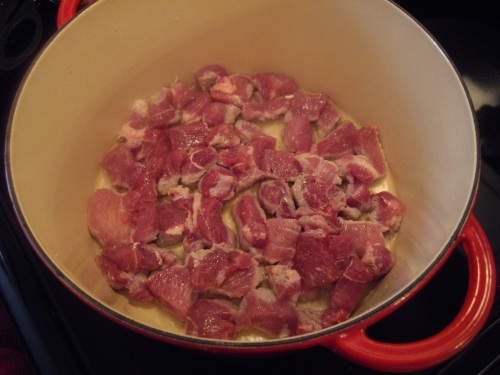 There are a lot of flavours in there, and they have plenty of time to develop as the pork braises for the next hour and a quarter. The topping, as I said, is basically cornbread. Once the filling is done, it gets transferred into a cast iron skillet, cheese is added, and the batter gets dropped on top. Bake for a half hour or so, and dinner is ready. This dish is not going to win any beauty contests, but it is delicious enough for that to be unimportant. 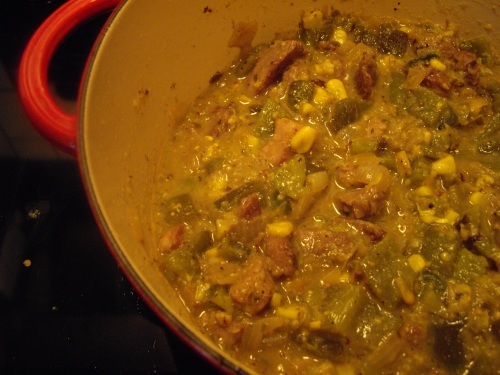 The pork filling is rich and has a nice kick that is well balanced by the cornbread. A dollop of sour cream is a nice addition, too, so put some out at the table. The recipe link is below, and I only made one minor change when I cooked it. 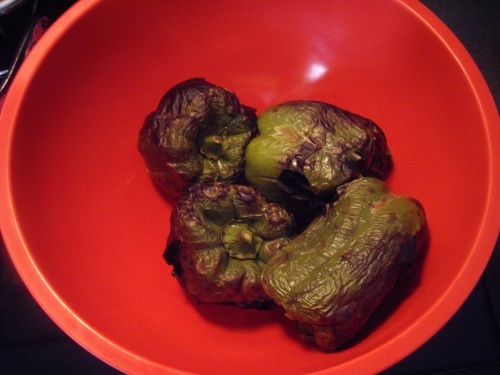 I couldn’t find poblano chilies at any of the stores near me; so instead, I used three medium green bell peppers and a jalapeno in their place. This worked well: poblanos are very mild chilies, so the green peppers plus a little heat from the jalapeno were good replacements. I hope you’ll give it a try and enjoy it. And stay tuned, because I’m not going anywhere. 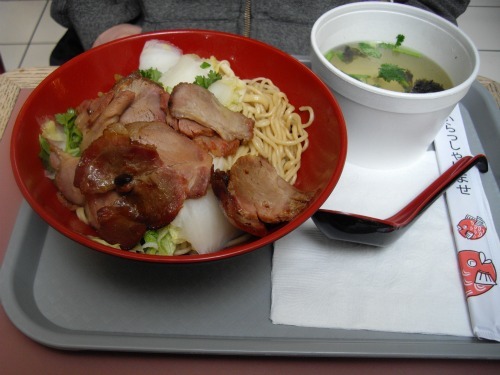 Yuki Ramen is a diamond in the rough, an unexceptional-looking restaurant in the food court of Montreal’s somewhat run down Faubourg shopping centre. Now, I wouldn’t normally expect to find any blog-worthy food at a food court, but there are always exceptions. I discovered it while running errands in the area one day and wanted a bite to eat. 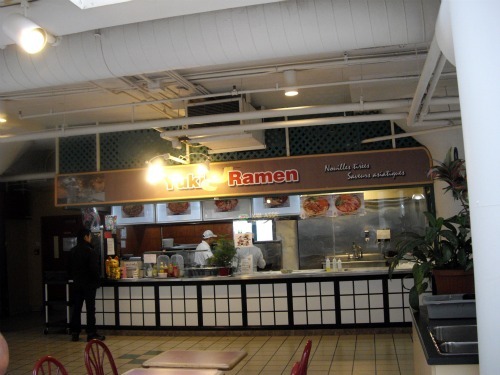 As I scanned the small selection of restaurants in the food court that were actually open, I was uninspired until my eyes settled on Yuki Ramen. I’ll be more specific: my eyes settled on the large window next to the restaurant’s cash register where a man stood spinning a long rope of dough between his hands. 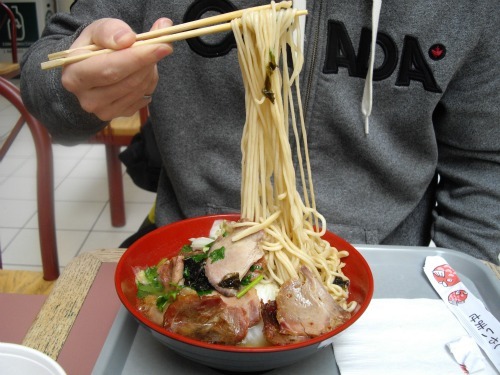 I couldn’t believe my luck: I had found a hand-pulled noodle shop. My research hasn’t been overly extensive in the subject, but from what I’ve seen and heard, these places are somewhat hard to come by in North America. Needless to say, I knew right away what I would have for lunch. I first heard of hand-pulled noodles from a wonderful post and video from Tiny Urban Kitchen. I found the video fascinating, and I really wanted to try these noodles, but I never got the courage to actually attempt to make them myself since I predicted it would take several failed attempts and a lot of frustration before I actually achieved something edible. So, as you can imagine, I was quite excited to find a place that actually serves hand-pulled noodles. I had a good feeling about Yuki Ramen before I’d even tasted their soup. 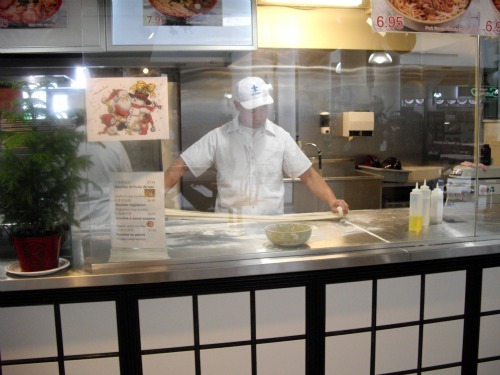 I loved what had drawn me there in the first place: the window that allows you to watch the cook at work as he pulls, twists, and spins dough into perfect, thin noodles. Watching the whole act is mesmerizing and appetite-whetting all at the same time. I liked that the menu was simple: numbered pictures displaying the different soup choices, and that’s all. There is no messing around with other menu options to please more palettes: ramen soup is what they do, and they do it very well. Andrew and I have been back several times as we’re in the area every Saturday, and it has quickly become a favourite. 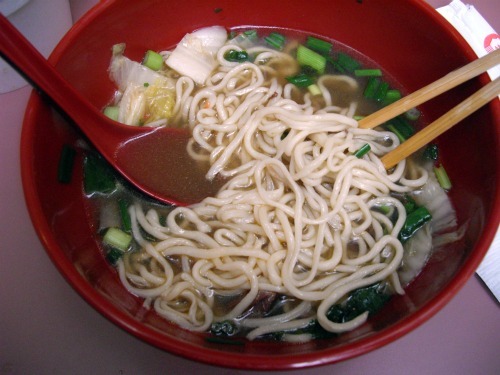 The contents of the different soups vary slightly, but in general, the ramen soup consists of a big bowl of mushrooms, bok choy, seaweed, coriander, your meat of choice, and, of course, beautiful, fresh, hand-pulled noodles, all floating in a clean, savoury broth. The noodles are soft, but have a slight spring to them. Their flavour is simple, but are absolutely addictive when soaked in the delicious ramen broth. 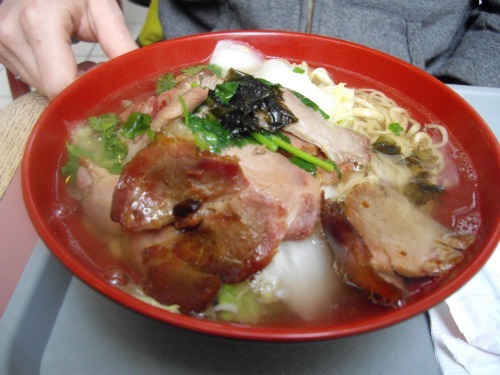 Andrew’s favourite is the barbeque pork, which comes with the broth on the side for you to pour over yourself. I’m a fan of this one too: the pork is moist, and lightly seasoned with a barbeque spice blend. I’ve also sampled the short rib ramen. The ribs melted in my mouth and combined with the rest of the soup components, made for a hearty winter meal. A few of the pieces I got were a little more tendon-y than I would have liked, but I got enough good meat to not mind very much putting those pieces on the side. I like the vegetarian one as well, despite the fact that all the ones I’ve tried that have meat have been amazing. 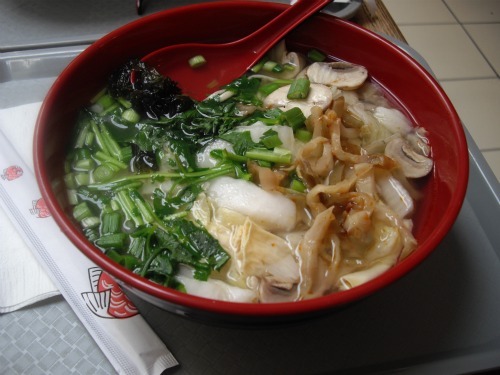 The vegetarian option has more mushrooms and other vegetables, and a cleaner, clearer broth. It’s lighter, but in my opinion, just as filling. Like I said before, I’m not normally one to sing the praises of food court restaurants, but this one is well worth a mention. 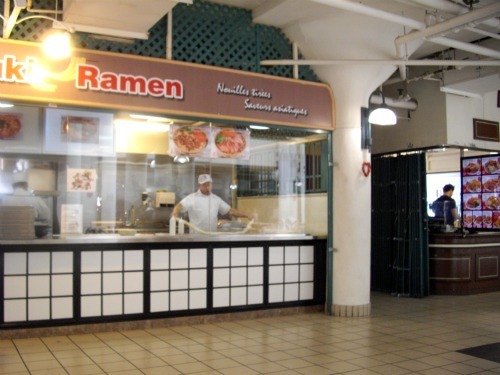 With quick service and reasonable prices (all soups are under $10), it’s a great student meal. Student or not, though, try this one out. During these cold winter days, I think you’ll find it’s just what you were craving. Being back in my beloved Montreal means that I have a long, almost overwhelming, list of restaurants I plan to try. Some are well-established favourites, some are hidden gems I’ve heard whispers about, and some are new and hot on the scene. Andrew and I embarked on this momentous task last weekend when we checked out the brand new FoodLab. FoodLab opened in November, and it is a restaurant, but it’s not like other restaurants you’ve been to before. It is housed in Montreal’s Society for Arts and Technology (SAT), an organization focused on research, and was created partly to help the society become more well-known in the city. What makes FoodLab so unique is that it is not-for-profit. This means that chefs Seth Gabrielse and Michelle Marek (formerly of Laloux) get to experiment, take risks, and make the food they want without having to worry about the bottom line. It also means that they can charge as little as $6 (and no more than $12) a plate for this top-quality fare. 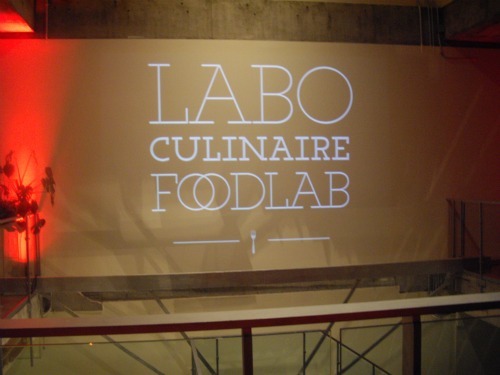 Although it is located on St. Laurent, in the Quartier des Spectacles, a prime restaurant spot, you won’t stumble upon FoodLab unless you already know it’s there. The restaurant is inside the SAT building, a rather institutional-looking structure. Andrew and I entered the glass doors to a large, empty echoing space. There is a reception desk, though, and the person sitting at it seemed to know right away what we were looking for, and instructed us to go to the third storey. So, up three flights of concrete stairs we went, and that is where we found FoodLab. The restaurant is located in another large, echoing space, but this one is far more inviting than the reception area. 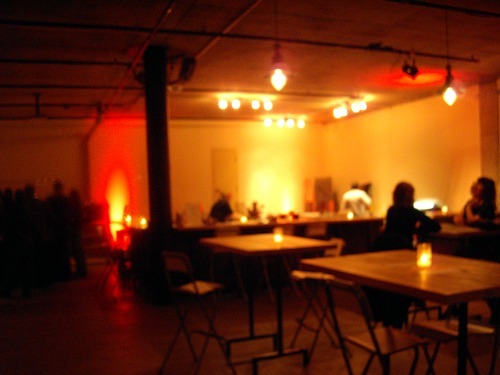 The room is dimly lit, and sparsely furnished with simple high tables and metal stools. 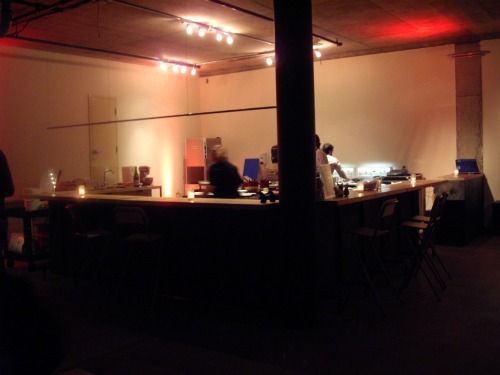 A bar takes up space on the back wall of the room, and the open kitchen takes up about a quarter of the restaurant. Separated from the rest of the room by a counter that diners can sit at, the kitchen is very simple with minimal equipment. Andrew and I could watch Gabrielse and Marek work with one other assistant on the large island taking up the centre of the kitchen, and the two household-grade stoves on the back wall. It didn’t look anything like any restaurant kitchen I’ve been in. I kind of felt like I was at someone’s house and they were cooking dinner for me. And I liked that. We took our seats and quickly learned that ordering is all done at the bar. The menu changes every week, and this week, the theme was French Winter. As for libations, a nice selection of wine is available, as well as a few beers and ciders. We started with the French onion soup. There is so much that was good about this soup: the broth was rich and flavourful, and had a unique quality that I hadn’t tasted before in onion soup. The taste was deeper and more complex than other onion soups I had had in the past. 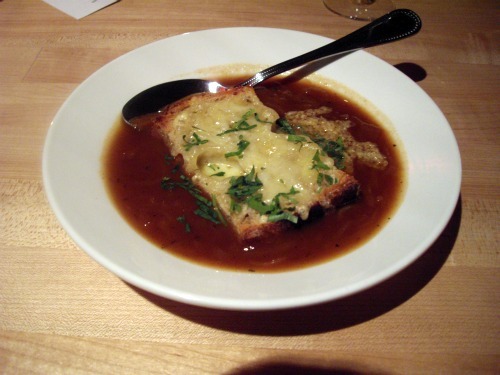 The bread was chewy and delicious soaked in the broth and topped with melted Gruyere. There was one thing that was not so good about this soup, though: the temperature. Unfortunately, the soup was tepid when it was delivered to us, and as much as I can understand how easily this can happen when working with the equipment and manpower FoodLab has, it really took away from my enjoyment of the dish. Next, Andrew and I split the salad with apples and walnuts. This salad was simple and unassuming and I really liked it. 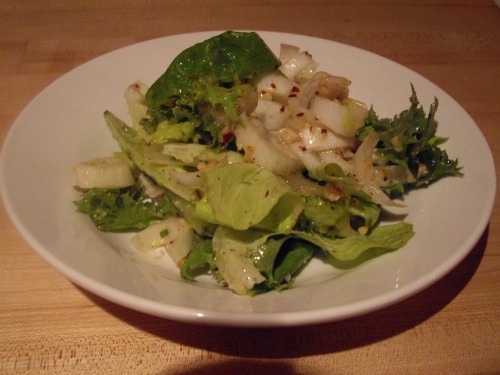 It consisted of a mix of lettuces, sliced endive, toasted walnuts, and apples, all tossed in a sweet and slightly tangy vinaigrette. The apples had been cooked and cooled, and were soft and sweet and velvety. I would have happily eaten a serving of them alone. 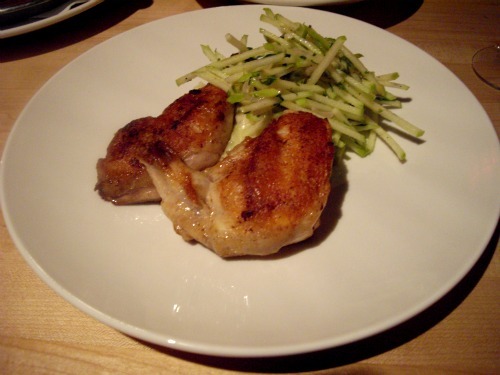 We each ordered the main dish, Cornish hen with buttered cabbage and acidulated apples. This dish was absolutely the star of the show. The hen was cooked sous vide, and then the skin was lightly seasoned and crisped in a pan. It was wonderful: the flesh was juicy and tender, and the skin was perfectly crisped and deliciously seasoned. The buttered cabbage was a winner as well, an unctuous mound of rich, buttered goodness, and the tart apple provided a refreshing contrast to the heavier components of the dish. We also split the Potatoes boulangère. 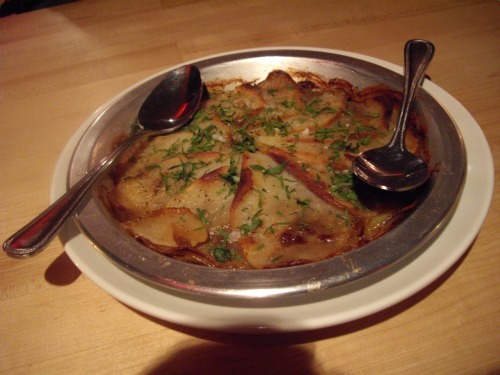 This is a classic French dish in which thinly sliced potatoes and onions are alternately layered in a shallow baking dish, covered in stock, and then baked until soft inside and golden on top. These were excellent, and I suspect some butter was involved in making these potatoes so creamy. I wasn’t complaining though: I just vowed to do a few extra sit-ups at the gym the next day. At this point, Andrew and I were completely stuffed and decided that we would have to miss out on the remaining three items on the menu: marinated house made goat cheese, far Breton (dessert), and the baguette. I had hoped that we would still have room to sample these, but it seemed like a bad idea to be ordering more food when we were already full. Our experience at FoodLab wasn’t perfect, but I definitely hope to go back. The venture is still very new, and I know that some kinks in the system still need to be worked out. Also, with a menu that changes every week, it seems criminal to not go back and see what else they come up with. Unless you live somewhere that remains warm and sunny throughout most of the year, cooking seasonally in the months of November through March is a challenge. 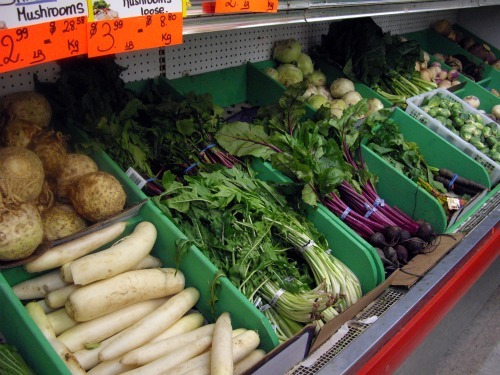 When I was living in Washington, my seasonal winter produce selection was definitely limited, consisting mainly of hearty greens, winter squash, mushrooms, apples, carrots, and onions. In Quebec, though, nothing grows during the winter. Absolutely nothing. 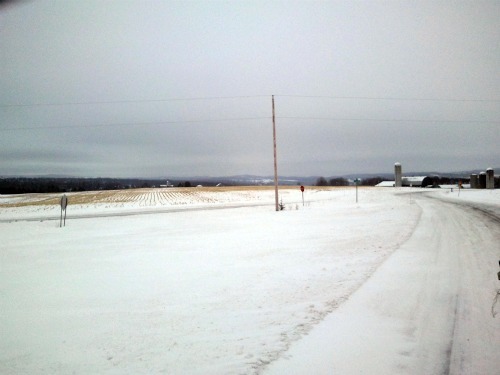 In this neck of the woods, everything freezes and is covered in a heavy blanket of snow and ice during the winter months, so the growing season is dormant. So, is it even possible to eat seasonally during the winter in a place where nothing grows during those months without getting scurvy? I am here to assure you that it is, but that it does take a little more effort than in the warmer months. There are a few options if you want to continue eating only local produce: one is to eat the local bounty that remains from the fall harvest. Root vegetables, apples, and pears all store well, and can last throughout the winter without rotting (if stored correctly). Another is to try some of the produce that is grown locally in greenhouses throughout the year. 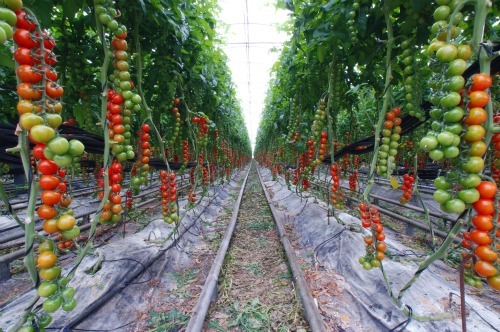 Greenhouses across Canada grow mainly tomatoes, lettuce, cucumbers, and peppers so that produce can be grown locally in a controlled environment at all times. The pros: buying greenhouse-produced veggies means not having to buy stuff that has been shipped all the way in from California, Mexico, Chile, or somewhere else far away. Also, fewer pesticides and chemicals are used in greenhouses, so even the nonorganic stuff is much closer to organic than field grown produce. There are cons as well, though: greenhouse-grown vegetables cost more to produce, so they cost more to purchase as well. Maybe this isn’t a problem for you, but it’s worth considering. It should also be noted that it takes a lot of energy to grow in a greenhouse, and so I don’t know how much smaller of a carbon footprint greenhouse growing makes. Finally, you can look for local produce that has been frozen or canned. In the case of canned, and sometimes of frozen, you are definitely losing some taste and nutrition, but if you’re really trying to only eat local, it’s an option. Or, if you’re really organized, you can spend your fall freezing and canning all of autumn’s bounty so that you can eat it throughout the winter. I hope to be that organized this fall, but we’ll see. I’ll admit, it’s one of those things I always say I’m going to do and then never actually get around to doing. Honestly, my take on the subject of eating locally, especially during the winter, is like my take on most things: everything in moderation. I understand the importance of eating locally for my health, for the planet’s health, and for the health of the local economy, but there are some cases where I think eating locally isn’t necessary. For one thing, I really don’t believe that it’s better for my health to be denying myself such a huge variety of fruits and vegetables throughout the winter because they don’t grow in Quebec during that time. There are some fruits that don’t grow in this part of the world at any time of year: if I were to only eat locally, I would never eat citrus, bananas, avocados, or just about any tropical fruit. These things never grow in Quebec, so does that mean I should never eat them? I say no way. I think that my health is better for having these items in my diet. The fact that they have to be shipped in from afar just means that I should eat less of them, and more of what I can get locally. Something that I will never ever get from Mexico or the southern U.S. —and I encourage you to do the same—is tomatoes. If you must have fresh tomatoes at this time of year, buy on the vine tomatoes that have been grown in greenhouses. If you’re not sure which are which, the greenhouse ones will be labelled “Product of Canada” (in the U.S. as well, for the most part). Why? The answer is long, but I’ll try to be brief: mass produced tomatoes are picked when they’re green and rock solid and sprayed with gas to ripen artificially. The labour to grow and harvest these tomatoes is often basically slave labour. In some cases, it is literally slave labour. For a crash course on the evils of industrial tomatoes, read this article. Andrew and I have salad with dinner most nights. During the winter, I make an effort to stick to the most local stuff possible, as I outlined above. Sometimes, this presents a challenge, but it’s also an opportunity to add some variety to my salad repertoire. 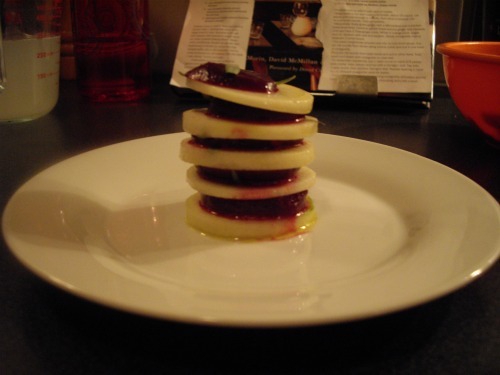 In looking through some old recipe clipping the other night, I found this one for Beet and Pear Napoleons with Ginger Juice Vinaigrette. This salad is an ideal representation of my philosophy on eating locally during the winter: most of it is local, but for the sake of healthy variety, some of it is not. Pears and beets are local, likely harvested a few months ago. You’ll notice in the recipe that there is supposed to be shredded apple on top, but Andrew ate the last apple, so I had to skip that component. In theory, though, apple would be another local contribution. Oranges are not local, but they are in season, so they will represent the seasonal, but imported, component of this salad. 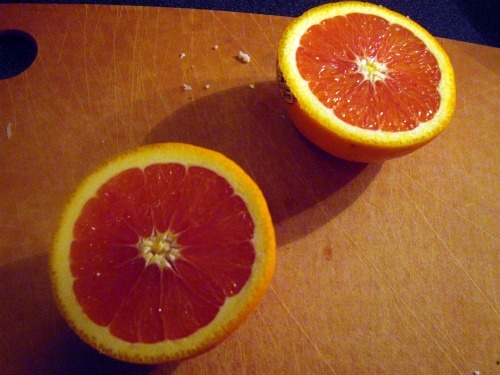 I opted for Cara Cara oranges this time, a less acidic, subtler variety of the navel orange. The lettuce is somewhat local, and grown in a greenhouse. At least, I assume so, as the label reads “Product of Canada.” It could have been grown in British Columbia, which is not exactly in the golden 100-mile radius of local eating, but there’s no way of knowing. Anyways, it will have to do as the greenhouse grown representative in this salad. But enough about local and not-local: this salad is a great salad because it tastes good. And it looks pretty. 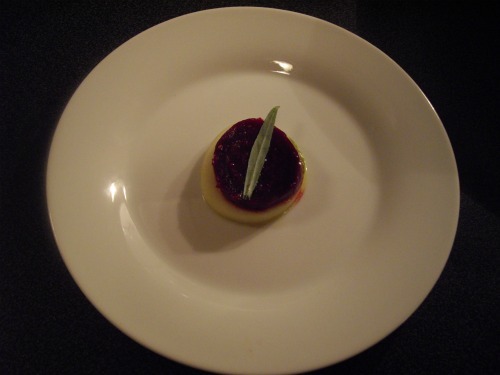 This is the type of dish that you can bust out at a dinner party and your guests will all ooh and aah and think that you’ve constructed something very complex, when really, all you’ve done is stack the ingredients instead of just plopping them down on the plate. 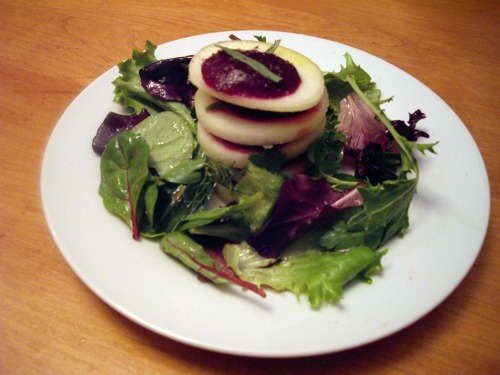 The beauty is in the contrast between the white pear, the deep purple beet, and the vibrant green lettuce. It might seem like eating locally is a lot of work, especially in the winter, and that’s because it is. I look at it as a challenge, though, and an opportunity to try new things and learn more about where my food comes from. And don’t forget: everything in moderation. I’m kind of starting to love it too. It’s definitely the sort of place that grows on you, and I’ll admit, I was not all that enchanted by the store the first time I went to it. It’s tiny and crowded and a far cry from the shiny, wide, well-lit aisles of a typical chain supermarket. If you go there with a specific list, it is unlikely that you’ll find everything on it, even the items that you would expect every grocery store to have. 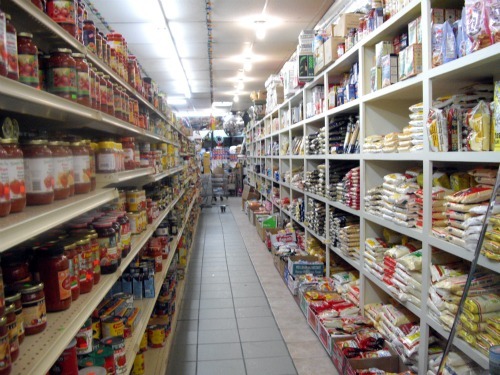 What you will find, though, are spices, sauces, and a variety of other products that you can never find anywhere else, and for a fraction of the price that fancy speciality stores charge. 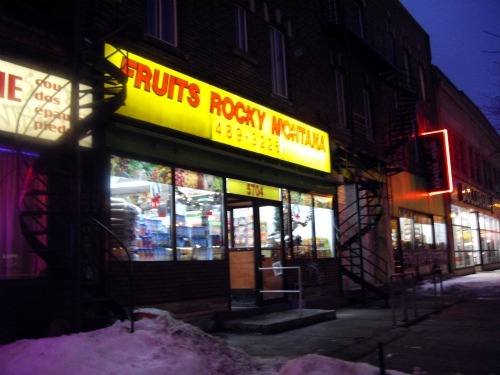 I’m going to go out on a limb and say that Rocky Montana is the type of place that suburbanites who are used to driving to the store and getting all of their groceries in one spot would not like very much. For city folks who walk, bus, or metro to get their groceries, and often shop at several different, smaller places, RM is a favourite go-to. So, let me take you on a tour of this fine establishment. The first thing you need to know, before you’ve even entered the store, is which door you must go through, because the answer is not obvious. When you walk up to the two doors under the sign, enter through the door on the left, not the one on the right, as you would normally do. Why the owners of the establishment decided that the doors should be reversed, I have no idea, but just accept it and move on. 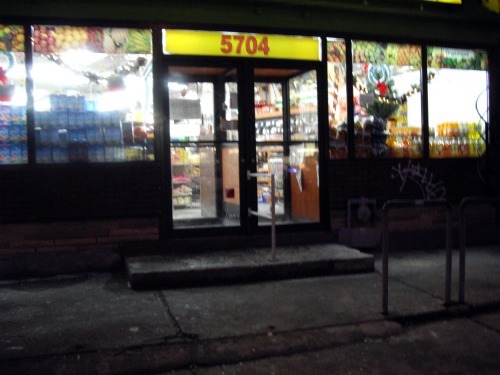 Once you’re through said door, you’ll be greeted by the sounds of Indian music and the sight of the register station directly in front of you. To your left are jam-packed shelves of baking staples, almond and soy milk, and organic broths. To your right are shopping baskets and carts. Don’t take a cart. There are few places in the store where a shopping cart actually fits and you will regret it. Instead, opt for a basket. If you’re planning on buying more than what fits in the basket, don’t. Just come back tomorrow and get whatever else you need. Walk through the shelves of nuts, seeds, and dried fruits (or grab a few along the way—the prices are unbeatable), and hang a right at the fruit stand. You need to pass this stand to get to the main fruit and vegetable section, which is no problem if isn’t someone standing there perusing (or restocking—there’s always someone restocking) the fruits on display. If there is, you’ll need to squeeze past this person, and you’ll probably end up bumping him or her with your basket, or stepping on his or her toes. Just say a polite, “Excusez-moi,” and carry on. You may want to pause for a moment to grab something from the alcove opposite the fruit stand where the impressive collection of Bob’s Red Mill products is kept, but don’t linger. That passageway can get hairy. Now, you’re through to the fruits and veg, an impressive part of the store. In this section, the Indian music is accompanied by a soundtrack of running water and chirping, tropical-sounding birds. I guess these calming sounds are supposed to make you want to purchase more fruits and vegetables. It kind of just makes me need to pee. The selection here is good, and you’ll want to take advantage. I only have two issues with the RM produce: none of it is organic, and among the nice, fresh, quality products, you’ll often find a number of fruits and veggies that are past their prime. Neither of these problems stops me from shopping there, though: for the products that I want to buy organic, I can go elsewhere, and I don’t have a problem with sorting through the less-than-fresh to find the good stuff. Also in this section is a fridge with a small selection of cheeses and dry sausage, and the impressive spice collection. You know that spice in that recipe you really want to try calls for that you can’t seem to find anywhere? They have it here. 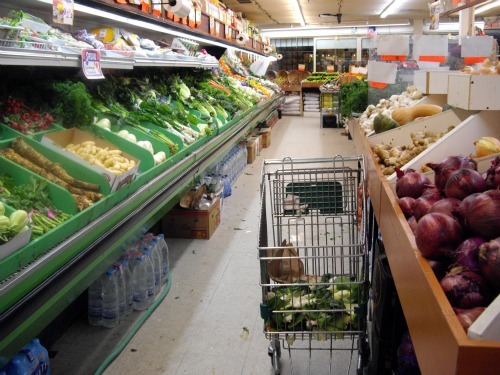 After maneuvering your way back out of the produce section, you can investigate the rest of the store: four aisles, with not a millimeter of space wasted. Along the right-hand and back walls of the store are fridges containing a variety of products, but the real treasures can be found in the shelves of dry goods. Once again, be careful, because the aisles are narrow, and your path will often be blocked with boxes that have yet to be unpacked. Don’t be annoyed: it’s part of the charm of the place. Now, there is no way I can itemize every type of product that is sold here, but let me give you a sample: a huge variety of Asian (Chinese, Japanese, Thai, Indian, etc. ), Mexican, and American sauces and condiments, oils, vinegars, dried beans, grains, a nice selection of gluten-free products, quinoa, a number of canned fish products, a variety of chips and cookies, nearly a quarter of an aisle full of tomato sauces, three shelves full of different types of honeys, and almost anything you can think of (and a lot of things you probably never thought of) that can come in a can or jar. 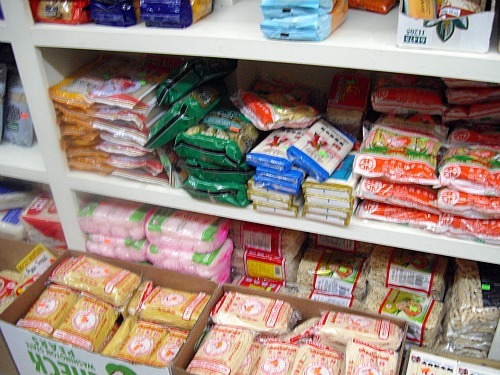 Oh, and I can’t leave out: an entire wall of the store dedicated to different pastas and noodles. Every type of noodle, from Italian to Asian and everything else in between, is represented on this wall. It is for wonders like this that I love this store. So have I enchanted you, or do you think I’m crazy for loving to shop at such an odd little place? My shopping habits have definitely changed since moving out of Redmond, or, that is to say, moving out of a suburb and into a more urban environment. I walk to the store, and I often get my groceries at several different places. I discover new shops every day, from the snobby fromagerie in Westmount, to the hippy co-op in my neck of the woods. I generally only buy what I need for one or two days, and go to the store way more often than I did before. It may sound like more work, but I don’t think that it is. It requires less planning, and I stress less about forgetting something when I’m buying food. I think Rocky Montana is kind of unique, but maybe I’m wrong. Do you know of a similar place? Would you rather shop there and at several different establishments, or are you more of a one-stop-shopper, preferring to get everything in one big store? Something you might often hear from people who cook a lot is that recipes are meant to be guidelines and that they do not need to be followed word-for-word. In fact, I know that I’ve said it in this blog a number of times, and there’s a reason for that: cooking becomes a lot more fun when you allow yourself to experiment. This is something I’ve come to realize in the past couple of years, and it has increased the pleasure I get from cooking many times over. Don’t get me wrong: I still think that recipes are important. Recipes can teach you, and in some cases, recipes know best. Good recipes have been tested in professional kitchens, and there’s a reason why there is no garlic in the ingredients list, or why the cheese should only be added at the last minute. But once you understand a recipe and some of the fundamentals of cooking, you can understand why a recipe is written the way it is. At this point, you can also see where the recipe allows room to move around. 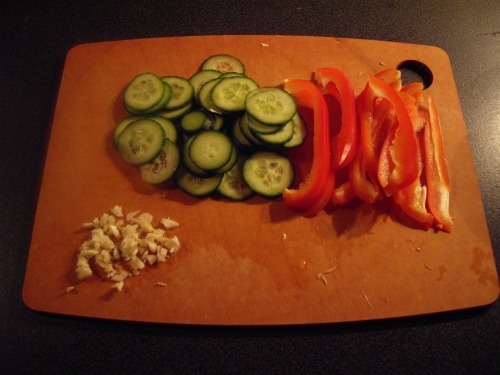 Sometimes altering a recipe is as simple as substituting different seasonings, or adding or omitting steps. 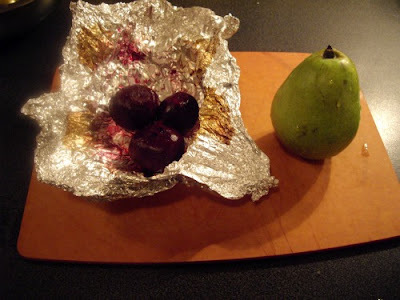 Sometimes it is as drastic as changing one of the primary ingredients, or using a different cooking method. You can make a recipe with meat vegetarian, or add meat to a vegetarian meal. You can add an Asian twist to a classic Italian dish, or modernize your grandmother’s famous recipe for beef stew. Once you start to play with recipes, you get to be creative with your food, and you become a cook who has her own signature recipes, instead of just a cook who can follow instructions. 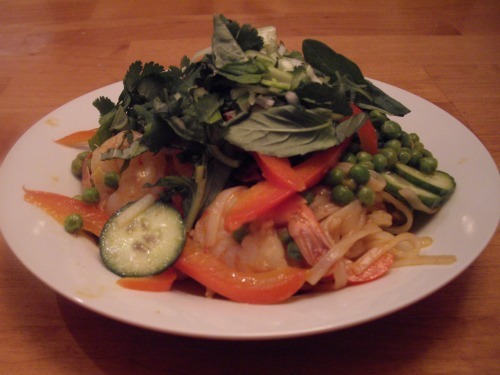 A few nights ago, I modified a cold shrimp and noodle salad recipe to make a hot shrimp and noodle stir-fry. The original recipe has you cook the noodles, and then cool them under cold water. It also says to make the dressing, then toss the cooked shrimp with a little of it. 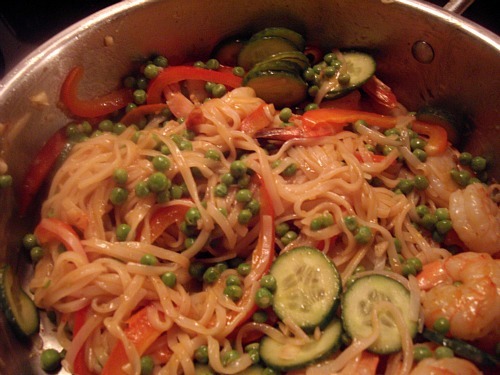 The salad comes together by simply placing the noodles in a bowl, topping with the remaining ingredients, and then drizzling with the rest of the dressing. It sounds like a perfect summer meal, but since this is January, I thought it would also make a perfect winter stir-fry. To change the recipe, I had to do more than just heat the ingredients up instead of serving them cold, though. For it to work, I had to understand how this recipe worked as a salad, and what I needed to do differently in order to make it work as a stir-fry. The recipe is this Asian Noodle Salad with Shrimp from Epicurious. My plan was to start to stir-fry the shrimp in some oil, then add some garlic, the red pepper, the peas, and the dressing, and then continue to stir-fry until the shrimp was just cooked. I knew that by cooking the dressing, I would lose some of it to evaporation, so I increased the quantities in the dressing by about a third. I also didn’t like the idea of eating totally plain, unseasoned rice noodles, so I tossed them with a little dressing immediately after draining them. The remaining steps are more or less the same. I changed some of the ingredients, mainly to accommodate what I already had on hand. I used frozen peas instead of sugar snap peas, I used basil instead of mint, and I added sliced green onion at the end as well. The stir-fry turned out beautifully. The combination of the sauce, along with the generous amount of fresh herbs added at the end, make this a very fresh and tasty meal. 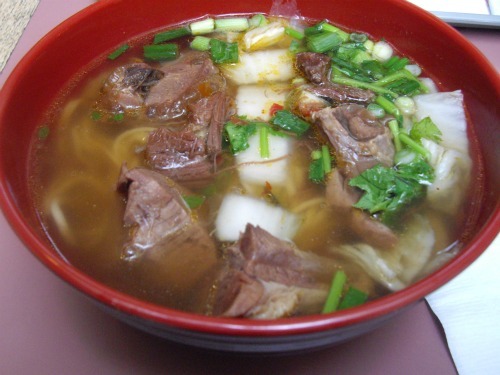 Adding dressing to the hot noodles was a good move, because they absorbed the flavouring very well. It was a bit of a risk turning a salad into a stir-fry—the results could have been very unappetizing—but this time, the risk paid off. To make the sauce, whisk together the lime juice, fish sauce, chili-garlic sauce, and sugar until the sugar dissolves. Cook the noodles in boiling salted water until tender, stirring occasionally, about 4 or 5 minutes. Drain, then immediately toss with about a tbsp of the sauce. Meanwhile, cook the shrimp. Heat a large skillet over medium heat. Add the oil and heat until shimmering. 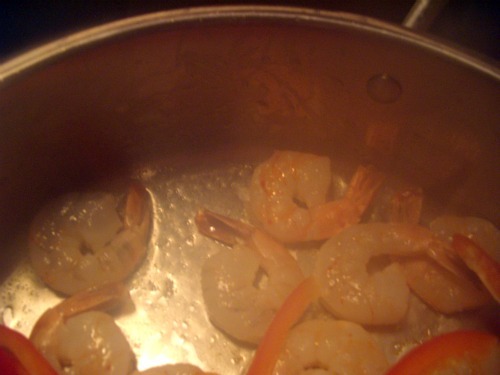 Add the shrimp and begin to sauté until they just begin to turn pink, 1 to 2 minutes. Add the garlic, stir for one minute, then add the sliced pepper. Sauté for an additional 2 minutes, then add the peas and the remainder of the sauce. Cook for about three minutes longer. The peas should be tender, and the shrimp should be cooked through. 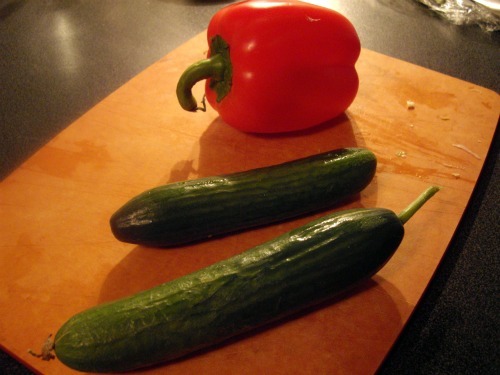 Turn off the heat, stir in the cucumber, and then stir in the noodles. To serve, divide the stir-fry between four bowls, and then top with the basil, cilantro, and green onion.